Whether you serve it as an accompaniment to grilled meats or as a brunch entree with sauteed bacon and warm crusty peasant bread or as an appetizer, we think that you'll find this warm mushroom pie created by Betty Rosbottom to be a delightful dish for family or friends! Without a doubt, 2009 was the year of the shappy mane. They were everywhere! 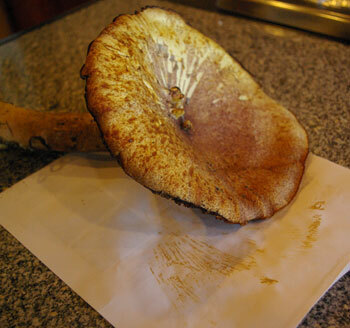 Gymnopilus spectabilis - an early Chirstmas present! Gymnopilus spectabilis - what a great gift! 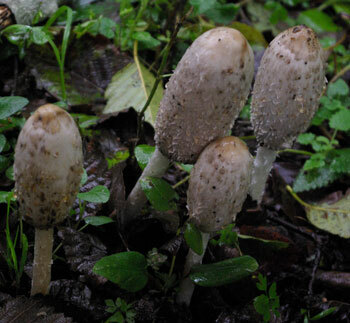 It's always a treat to find a mushroom that we've never encountered in Port Orford before. We'd been out gathering chanterelles the other weekend, enjoying the warmth of the day and the treasures on the forest floor, when we came upon a cluster of Gymnopilus spectabilis thriving around the base of an old snag. We stood there, mesmerized by the spectacular display! The cap of the specimen shown below 8 1/2", the stem is 8" long with a circumference of 4 5/8"! The spore sprint is a bright rusty-orange color. Yes, this mushroom is certainly inedible. That's OK. We don't have to consume every mushroom that we come upon. Many times the discovery of a mushroom such as the gymnopilus spectabilis is satisfying because it feeds the soul of a mushroomer! The bright rusty-orange spores are evident in this photo.